Clare Young is making an amazing knitted garden in memory of her husband Ken to raise money for the Sue Ryder Leckhampton Court Hospice, home to the only hospice inpatient beds in the county of Gloucestershire. 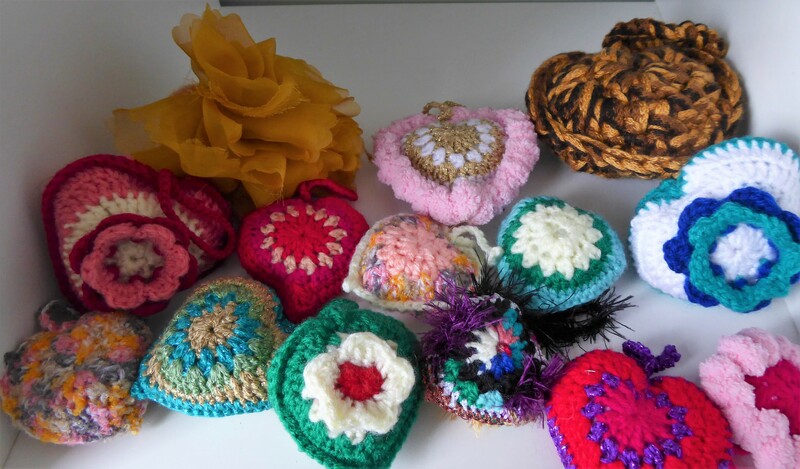 You can read more about the project, and see pictures of some of the gorgeous things Clare has made at the Work Of Heart Garden website. You can also join in and help with the fund-raising by making small hearts to be displayed in the garden. Free knitting and crochet patterns are available to download at the website, but you can use any pattern you like. The aim is to get 10,000 hearts, so every little bit helps! Remember to add a loop so your heart can hang up. I’ve sent this random assortment off so far. Not immensely proud of them, but there’s time for me to redeem myself by making some more. The knitted garden will be on display at the RHS Malvern Spring Festival. I will definitely be visiting – I can’t wait to see all the yarncraft treasures in real life! Posted in Charity Projects, Collaborative Projects, Crochet, Yarn CraftTagged #WorkofHeartGarden, charity, Clare Young, crocheted hearts, hearts, knitted flowers, knitted hearts, RHS Malvern Spring Festival, Sue Ryder Leckhampton Court Hospice, Work Of Heart GardenBookmark the permalink.